Recently in was in South Eastern Ohio and saw extensive damage caused by 17 Year Cicada...what a mess! This little fellow is pretty neat looking. It is a beautiful creature! At first glance, Phil said it was a cicada. The bugged eyes would fit. But the ones I have seen have red eyes. He is beautiful, but I wouldn't want him ON me. Just very interesting to look at. 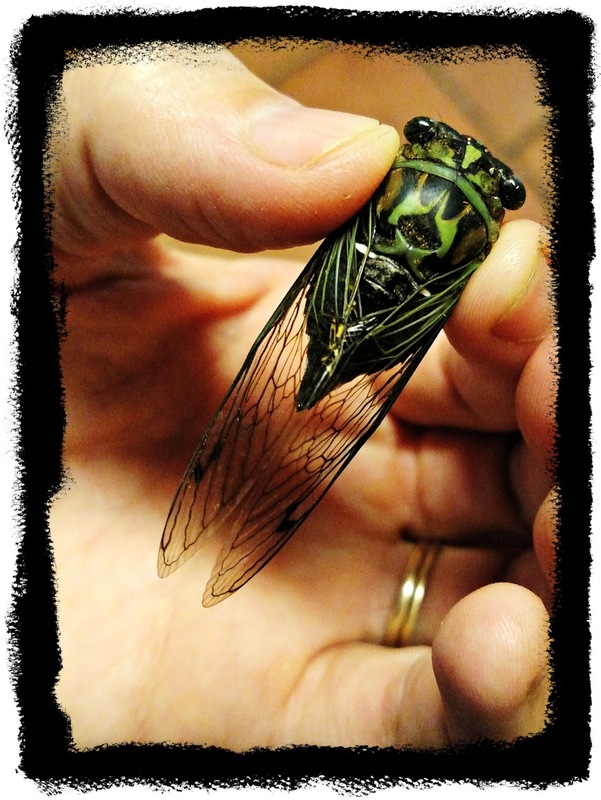 I wonder if there are different kinds of cicada? This would be my thought. I bet the boys LOVED this!! Formaldehyde jars are in order! As I understand it there are thousands of variants tot he cicada with many regional ones that often don't emerge from the ground for 15 to 30 year cycles so we are constantly seeing new colored ones. We have an orange and black one around my neck of the woods that only comes out every 15 years. A Cicada, but in Appalachia speak known as a Jarfly. I found one just the other day. They are oddly beautiful. and I think you are an amazing brave mom... to hold that bug! I like bugs. They are "creepy cool" as I always say. I am not sure what kind of cicada...but that is a cicada. My frogs LOVE to eat them! At a glance, it looks like some kind of Cicada...but I don't think I've ever seen one with that kind of coloring. I never saw one like that, but have to say yes, pretty colors! What amazing markings! Honestly, I thought you were holding up a fake bug. I don't know if we have anything like that here in Connecticut. My personal favorite, as far as bugs go, is the stick bug. They fascinate me too because of their "camouflage-like" ability. I can't say I know what kind of bug it is, but it's interesting. Wow that is pretty! It looks like a colorful Cicada to me. I saw the most interesting bugs when I lived in Georgia.